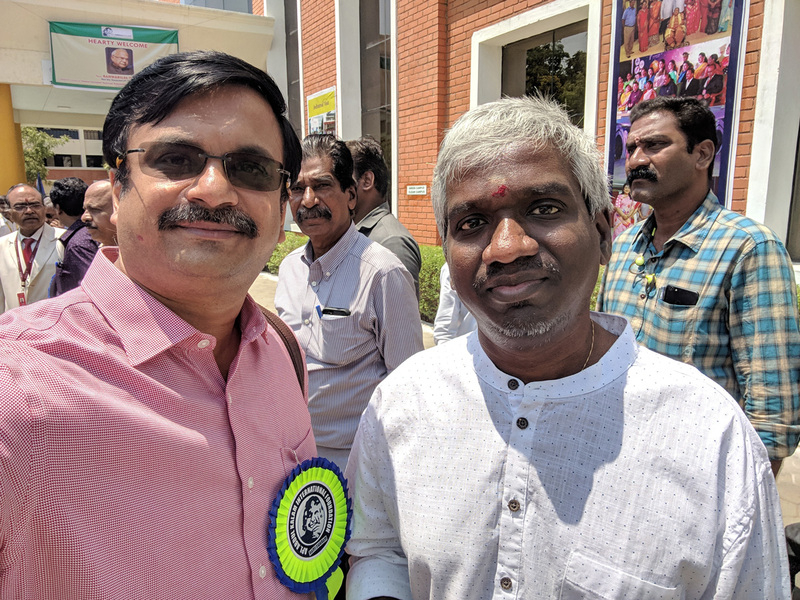 I love going for heritage walks conducted by MMM (the Man from Madras Musings) – Chennai’s beloved historian Sriram V. MMM is a walking treasure trove of facts, stories and gossips that are centuries old. This recent one I went to, was the only Island in Madras. 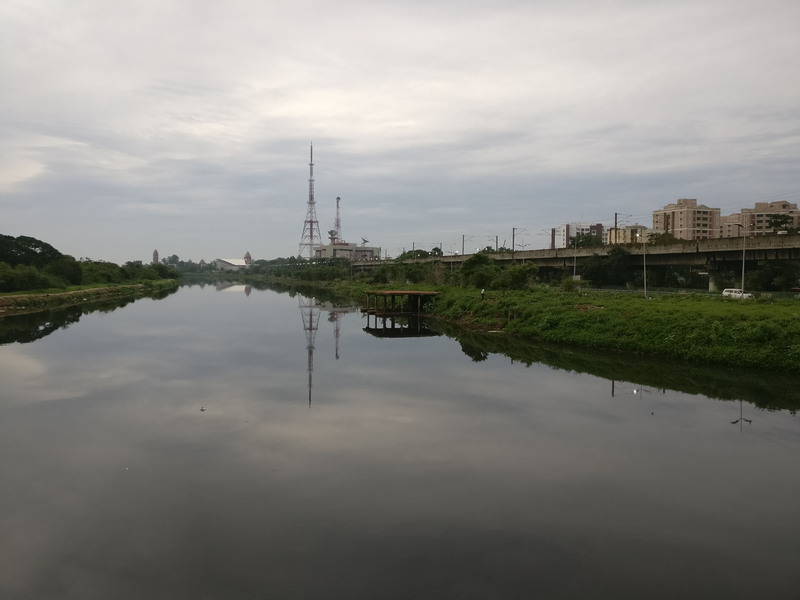 After 1639 when the British settled near St.George, they acquired land to the west which had the Cooum River on one side and the Elambore River (now it is part of Buckingham Canal) on the other side; later they connected the two rivers through a channel, thereby creating this Island. Elambore River (then) was only 300 yards. Thomas Pitt who was the Governor of Madras in 1698 converted the Island into a garden. The Island also served as a buffer security zone for the British who had their Barracks in Mount – the Mount Road got its name as it was connecting the Island to the Mount. 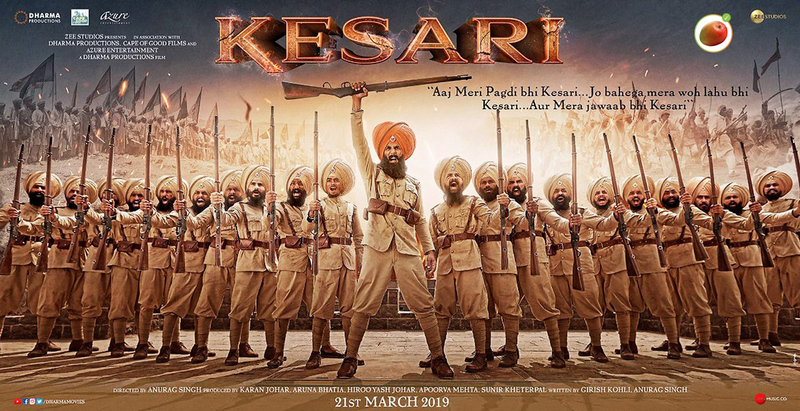 Even today, a part of the Island is controlled by Indian Army. 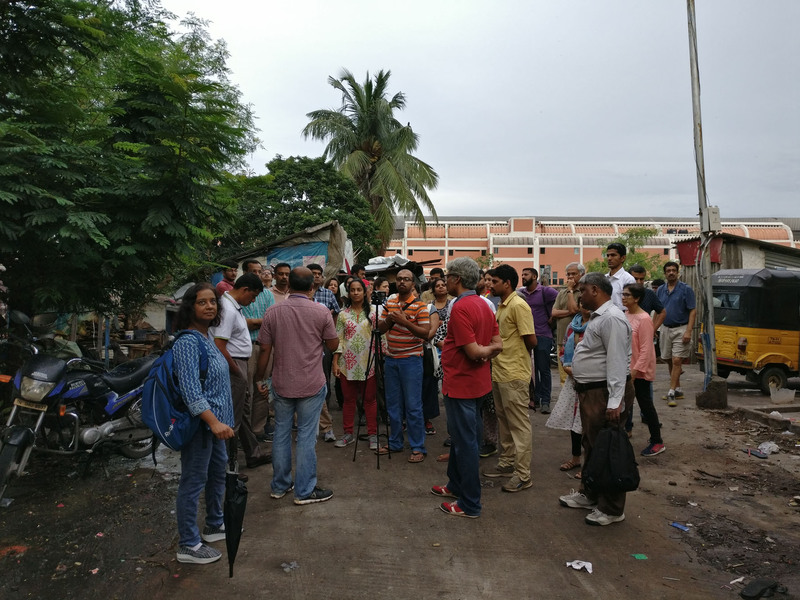 We assembled in front of Madras Gymkhana Club and heard stories about the Government house (now demolished, was near present-day Rajaji Hall). 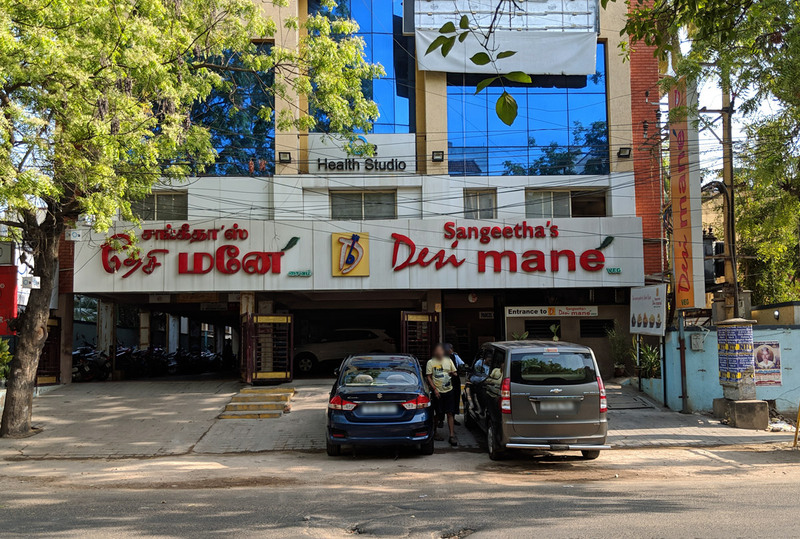 Then, we walked south-west to Swami Sivananda Salai (where TV station is present). 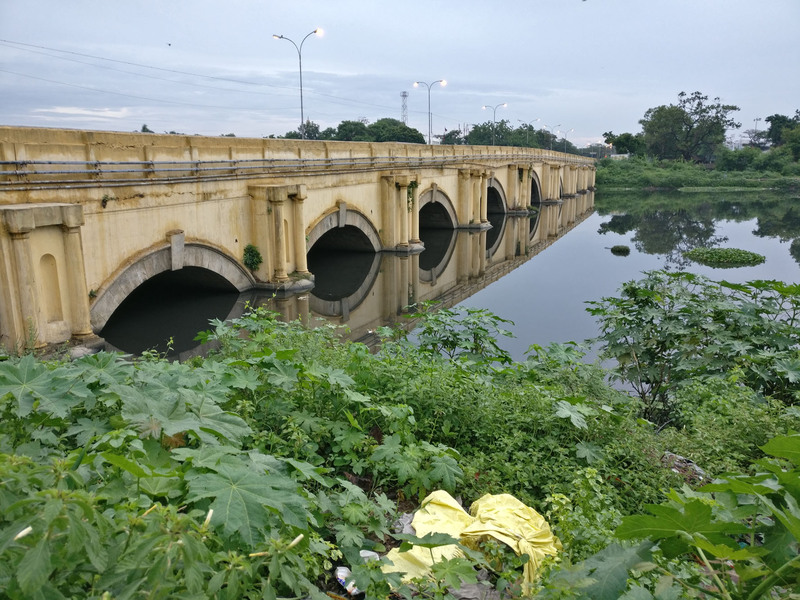 Standing from the side of the road, looking over the bushes we saw a view of a bridge (now called Periyar Paalam) over the Cooum river – built in 1805, the St. George Bridge, as it was called then, connected the island to Triplicane, for that reason it was also called as Triplicane bridge. 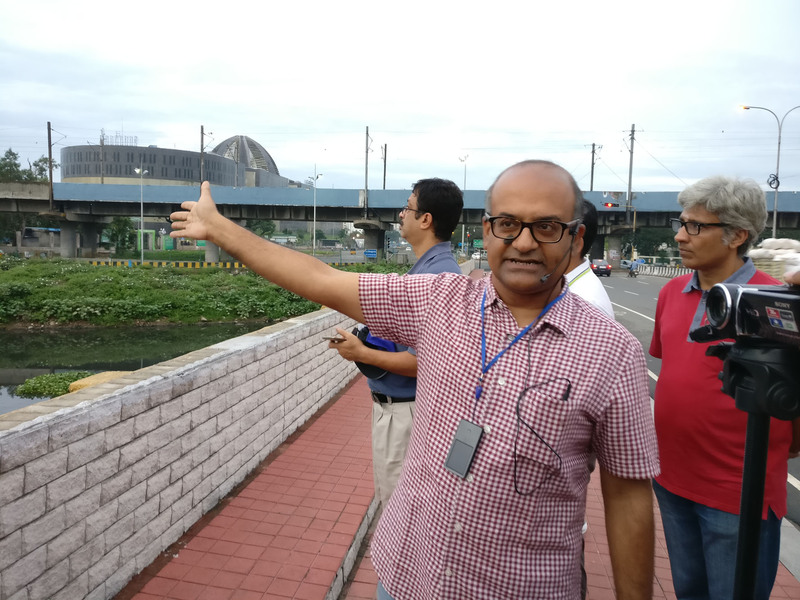 Looking at the beautiful bridge, Sriram expressed his anguish on “What we could’ve done, what we have done with this Island”. Then, we crossed over to the other side of Mount Road (westward, opposite to Chintadripet MRTS station) into a small lane of dwellings. 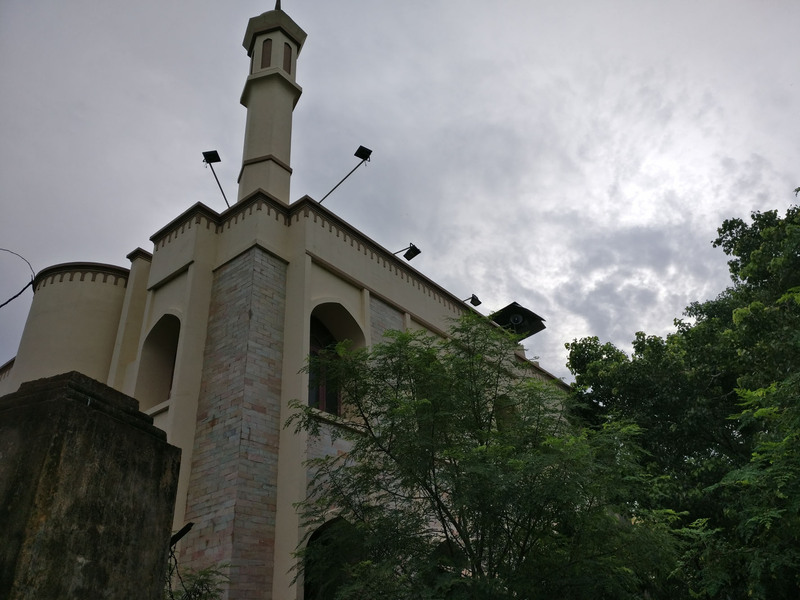 We learned that this area would’ve been where the bodyguards of British Governors lived – as soon as the bodyguards started living there, a temple and mosque was constructed in the area, as by 1850 Indians were allowed to work as Governor’s Bodyguards. A shining new mosque is present now, where the mosque for Governor’s Bodyguard would’ve been in the 1800s. 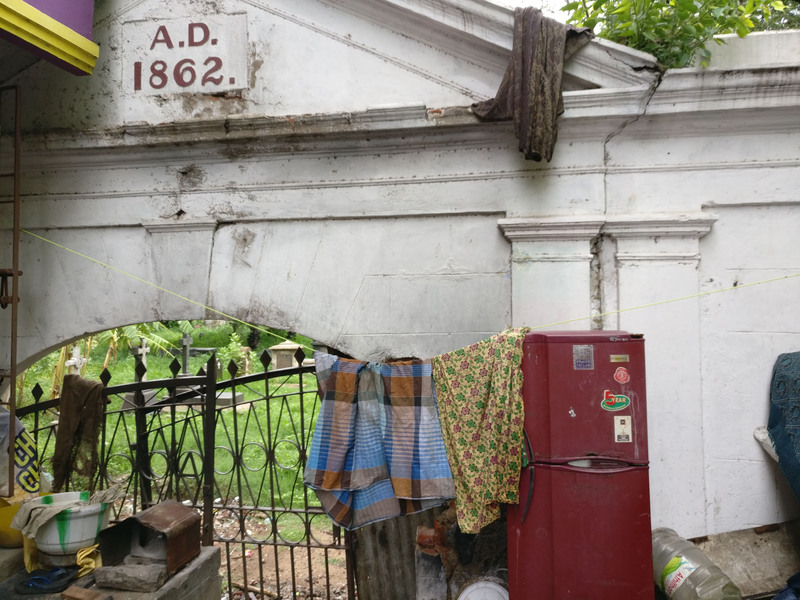 Next stop was St.Mary’s Cemetery, which is in Pallavan Salai (old Band Practice Road) under the overbridge that goes to the Central station. During the British days, the Governors coming by train from other parts of the subcontinent would’ve got down in Central Station and brought in a parade to Government House, during that they would’ve been received with a Band performance – that’s why this road was called the Band Practice Road. 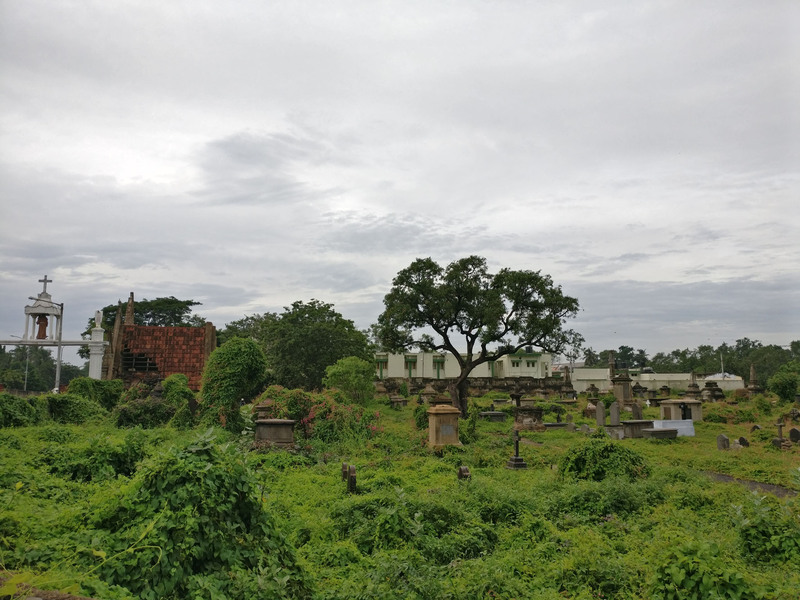 Rajnikanth‘s Billa (1980) shooting was done in this cemetery. The average age of people who were buried here ranges from 4 to 40. The story for the cemetery’s origin goes like this, the oldest cemetery for British in Madras was at the Guava Garden (now the Law College), but when the French occupied Madras in 1758 they were using the place (and the heavy stones from there) to attack the British; identifying the security risk the area was flattened and the tombs were moved inside the fort and then to St.Mary’s Cemetry on the Island – it took 11 years after the orders, for burials to seize in Guava Garden. Stephen Popham, the man who built the Broadway area in Madras, was buried here in St.Mary’s; he created Broadway (Broadest way) by filling up a drain in the new Black Town area by using the fill he got by levelling Hog Hill (Narimedu). 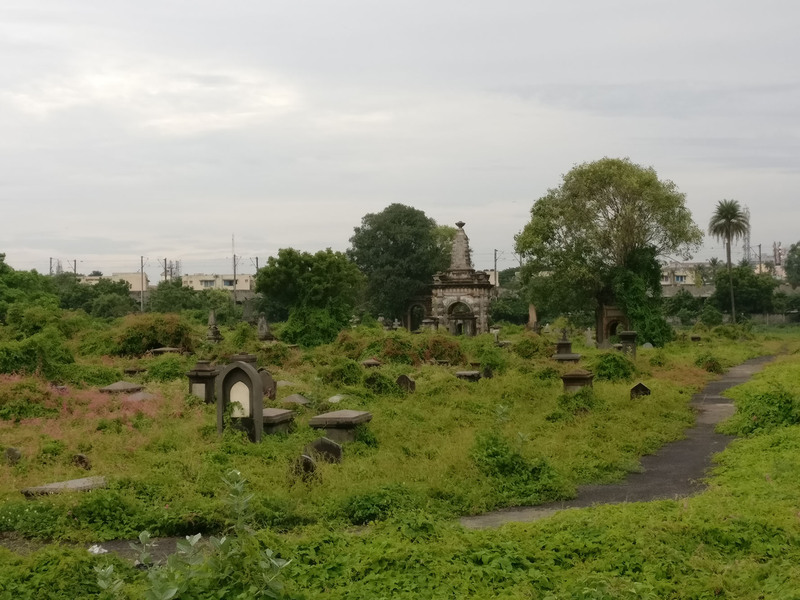 James Anderson (1739-1809) who was a qualified surgeon who came to Madras in 1761 from Edinburgh, Scotland, was buried here too. Anderson is credited with establishing the first botanical garden in the country – a Nopalry (a cactus garden) in 1789 in today’s Nandanam, Chennai area and later he set up Anderson Gardens (today the area will be opposite to Shastri Bhavan in Haddows Road). The plants from here were later moved to Bangalore’s Lalbagh Gardens. Anderson succeeded in rearing silkworks first in Madras in December 1790, which then led to the growth of the silk farming in areas around Mysore. 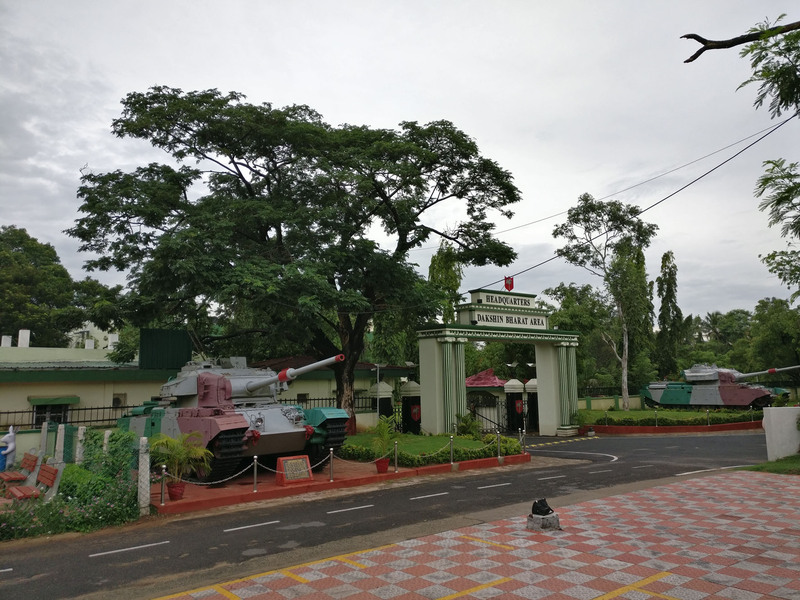 Behind St.Mary’s Cemetry, lies Commonwealth wartime cemetery, which we didn’t visit – Sriram mentioned that it was well maintained as it is under the control of Indian Army. Near it is the grave of Brigadier Nicholson and his wife Adela Florence Nicolson, who wrote under the pen name Laurence Hope many works including “Pale Hands I Loved Beside The Shalimar” from her book “The Garden of Kama (1901)“, which is available for free from Project Gutenberg. 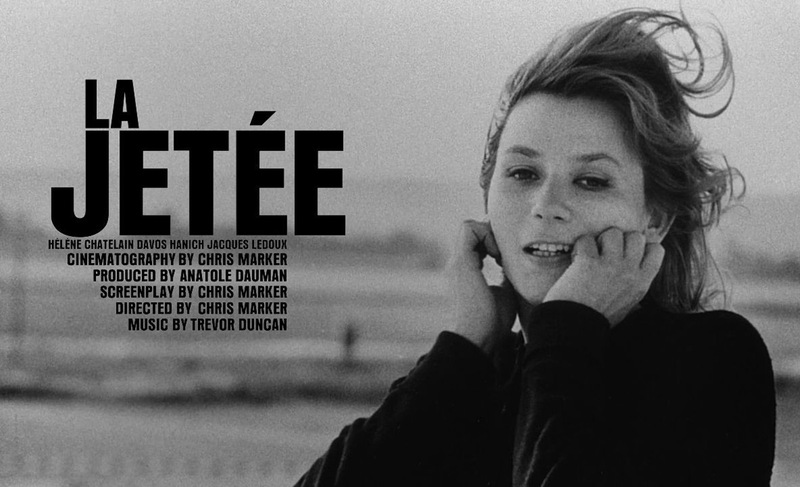 The poems are believed to have been written by Laurence Hope in her love for another woman. 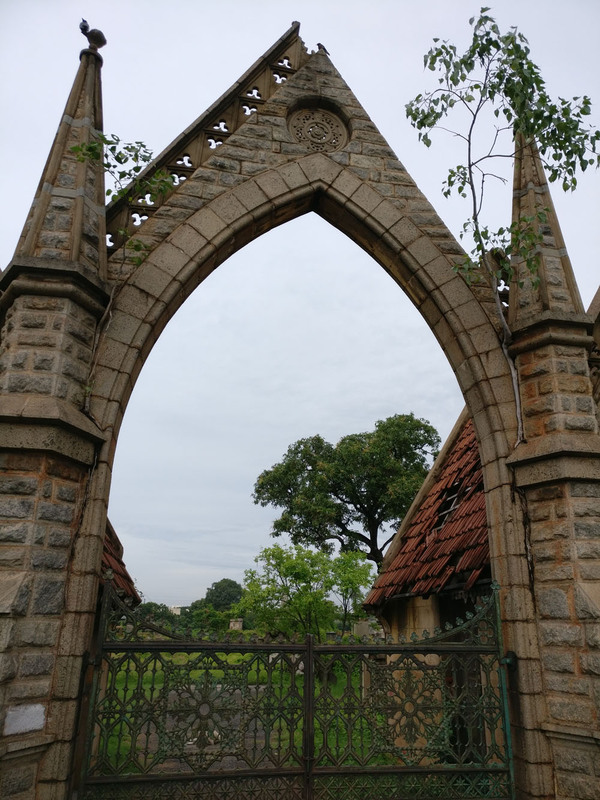 Next, we returned near Bodyguard Muneeswaran (due to Governor’s bodyguards) temple and then took a U-Turn to the side road on the right of the bridge to the by-lanes to reach Armenian Cemetery. The cemetery today is difficult to reach, unlike in the past when the overbridge to Central was just a causeway, the Stanley Viaduct. 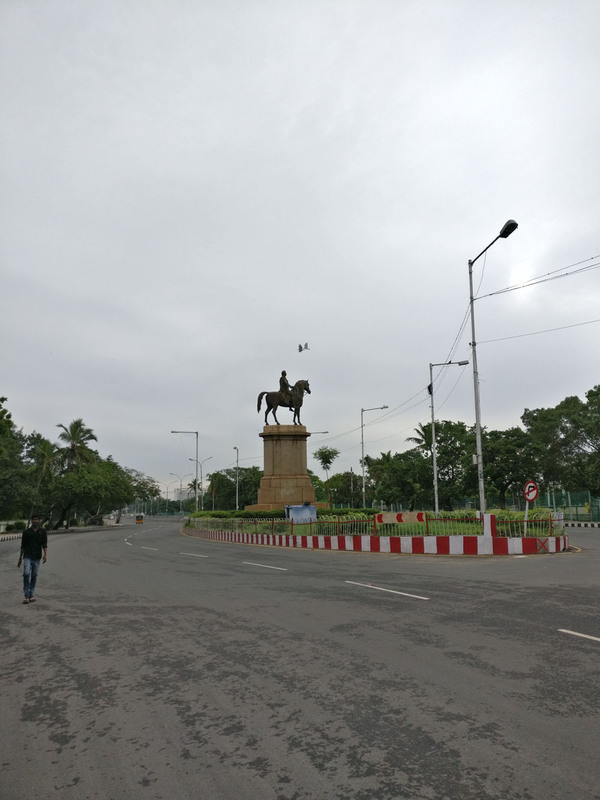 The next place we came to, was the famous Sir Thomas Munro (1761-1827) statue (detailed articles are in Madras Musings – Oct 16, 2012, & Nov 1, 2012). Munro had done a lot to Madras state, he protested against Cornwallis plan to bring the Zamindari system (Permanent Settlement) from Bengal to all over India. Munro was all for administration in the local language. Munro instituted the offering of Pongal dish to the deity at Sri Venkateswara Swamy in Tirumala and even today the vessel used for it is known as the Munro Gangalam. He also waived taxes for the Raghavendra Swami Mutt in Mantralayam after what is believed to be his conversation with the Swami from his brindavanam there. HMS Asia, was the ship that Munro had booked for his return to Britain, but few days before his trip while on tour near areas around Tirupati, it is told he saw a Golden Garland glowing on top of Tirumala hills – it was explained to him by people around, that it is only the blessed who gets to see the divine sighting and it indicates his days on earth is limited; just as told he dies in few days and is buried near Gooty (Andhra Pradesh). In 1828 Francis Chantrey receives the order for an Equestrian (riding on a horse) Statue in Bronze of Sir Thomas Munro. 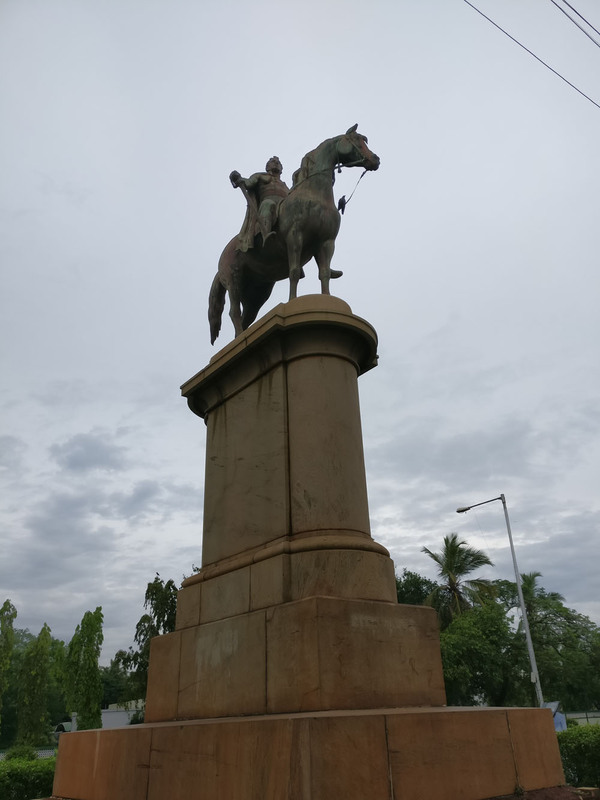 Francis Cunningham (who was the son of Chantrey’s assistant Allan Cunningham) was the one who travels to Madras to have the statue installed, which weighed over six tonnes and arrived in Madras from Britain in three parts. 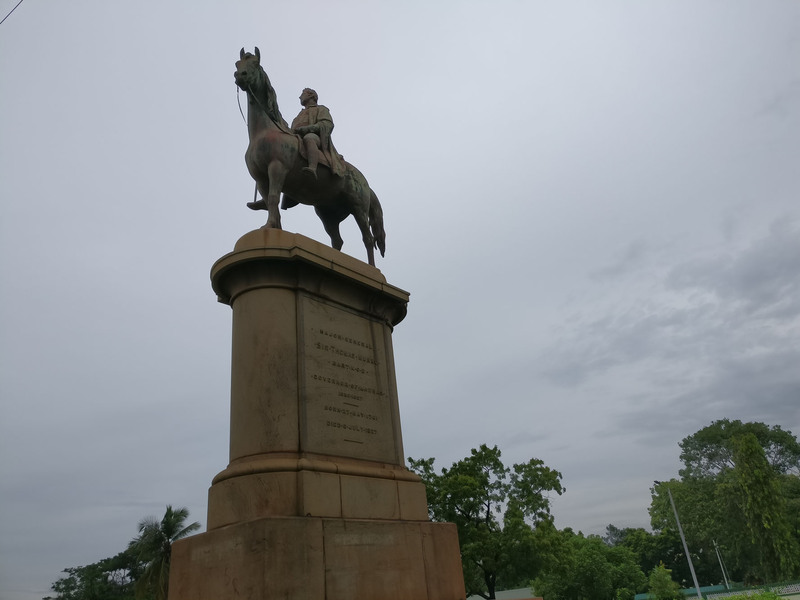 Later, Francis became an assistant to Sir Mark Cubbon and played an important role in the development of the Lalbagh Horticultural Gardens, Bangalore, and Cunningham Road in that city is named after him. The pedestal for Munro’s statue was done by G.S.AUSDOTER, a German family business in Madras. Our last stop was the same place we started, Madras Gymkhana Club. We heard the story of Willington’s. The First Lady of Madras — Marie Adelaide Freeman-Thomas, Marchioness of Willingdon with her husband Baron Willington arrived in 1913 to India. He was first the Governor of Bombay, then Governor of Madras, then Governor-General of Canada and finally to become Viceroy of India. Sir CP Ramaswami Iyer was addressed as “Dear one” by Lady Willington. Purple was her favourite colour and the city (then) got its fair share of the colour during their time. During their tenure in India, the family had accumulated boatloads of gifts and transporting them to London was a challenge of its own.